The people who made the “apartment hotel” respectable again have upped their luxury-flexible-stay-for-the-rest-of-us game with their Village at Valley Forge property. Way back in the late 19th century, when apartment buildings first began to appear in American cities, some of the early pioneers referred to their structures as “apartment hotels” to associate them with a more familiar form of multi-unit residence. Over the years, the term became more closely associated with single-room flophouses, and after World War II, “apartment hotels” gradually disappeared from America’s older cities. They’re back now, and they’re far more luxurious. Korman Communities’ aka brand has set the standard for luxury in flexible-stay furnished residences, as these properties are known technically. 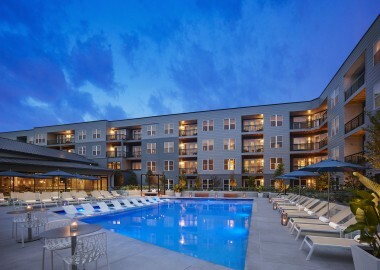 The company also operates a less pricey but still luxurious collection of flexible-stay apartment complexes known as AVE, most of whose properties are located in the suburbs of our larger cities. AVE King of Prussia is the latest addition to the chain. Located in the Village at Valley Forge, it offers a level of convenience matched by few suburban apartment complexes of its type — and none in King of Prussia itself. About the only thing missing is the sit-down restaurant — and residents need only walk for five to ten minutes, or borrow one of AVE’s seasonal bike shares and ride, down Goddard Boulevard to the adjacent King of Prussia Town Center to find plenty of those, including one in the center’s huge Wegmans supermarket. Residents of both the furnished flexible-stay apartments and the unfurnished apartments for rent can enjoy a complimentary club breakfast on weekday mornings and a program of catered functions, receptions and special events throughout the year. Originality distinguishes this building’s common facilities from those of others in its class. Custom-designed lighting and furniture make the cafe and central lounge urbane and sophisticated spaces. The same level of distinctiveness can be found in AVE’s meeting and function rooms, its lobby, its gym and its outdoor common areas. In fact, it’s so original it even has its own scent. The air in the lobby and cafe is infused with a fragrance produced especially for AVE King of Prussia. Other stuff: The building is pet-friendly; amenities include a dog wash station. In addition to the seasonal bike share, bike storage, a bike repair station and electric vehicle charging stations are available in the garage. Written by Sandy Smith; Originally published in Philadelphia Magazine.